Ever since I read “Why It’s Time To Break The Code Of Silence At The Airport” by Christopher Elliott (15 February 2013, TheHuffingtonPost) and my daughter’s TSA posts (including “TSA Touching Crosses The Line: Update”), I have been considering how much more invasive and offensive the TSA has become over time and how we enable this behavior by not objecting to it. This weekend, I flew from the San Francisco Bay Area to Los Angeles for training (to renew my mentor certification with Education for Ministry, a program of the University of the South – School of Theology), and to visit my brother and family in La Crescenta. I used two small-ish airports, San Jose (SJC) and Burbank (BUR) for convenience. This morning, I walked quickly to the head of the extremely short security check point line at Burbank, hoping to have time for a quiet coffee before boarding my flight home. 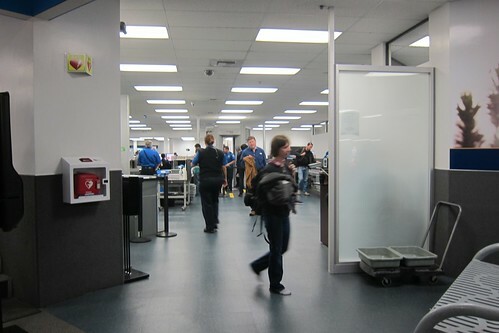 However, I was pulled out of line in the nearly-empty security area not once but twice. 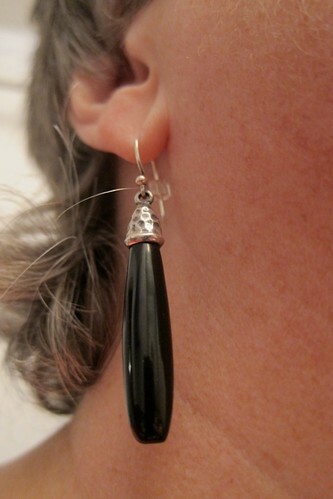 The first time I was pulled from line was so that the security lady could feel my face – after her full-body scanner drew a little yellow box around my apparently-dangerous earring. As you can see from the picture below (and as she herself could clearly see), there wasn’t anything for her to find while she patted down my ear, cheek, and short hair. The second time I was pulled out a few minutes later was so that the security man could unpack my small roller bag, re-scan my toiletries, and try to take away my rock. 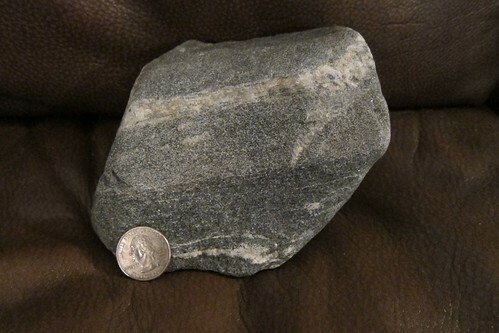 I was bringing home a small piece of granite as a souvenir of La Crescenta. He said, after feeling my rock, that I had to get rid of it or check my bag because a rock could be a weapon. It seems that there is a TSA rule saying that rocks over five pounds are dangerous. I chose to keep my rock, so I was escorted out of the security area, then had to walk back to the airline counter (where the counter lady told me that she hears an unusual number of complaints about the Burbank TSA), check my carry-on bag, and go through security all over again. I made my flight home, but no quiet coffee for me. I object.